Emmy award-winning Chef, Michael Chiarello is a past competitor on "Top Chef Masters," a current competitor on "The Next Iron Chef," and is also a renowned cookbook author. His love of cooking stems from his family's southern Italian roots, complimented by the flavor of the vine. And, in "THE Dish" on "The Early Show on Saturday Morning," Chiarello demonstrated that a savory Italian meal must begin with an incredible sauce as its foundation. Chiarello honored his roots with a dish featuring his grandmother's "Old Hen Tomato Sauce" added to ricotta gnocchi - otherwise known as, Ricotta Gnocchi with Salsa Della Nonna. 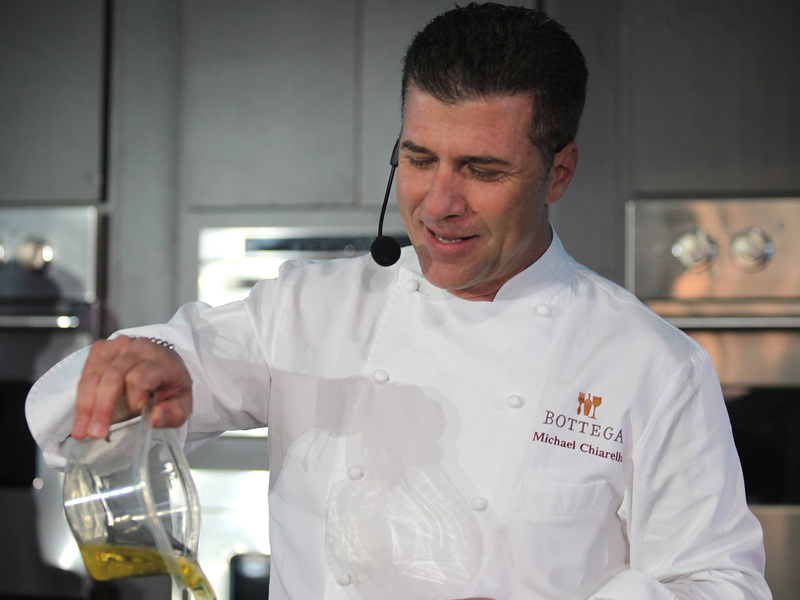 Chiarello's culinary talents flourish being both the chef and owner of the Napa valley restaurant, Bottega. There he combines his southern Italian roots with a Napa-style flare. Chiarello's culinary roots run deep. He grew up surrounded by an Italian family of butchers, cheesemakers and ranchers, according to his official bio. His aspirations of one day becoming a renowned chef have come to fruition with a hugely successful restaurant and multiple cookbooks. On "THE Dish," a different famous chef each week reveals what he or she would have if they could have just one meal. Check out how you can make Chiarello's dish at home with the recipe below. The rich traditional sauce is my grandmother's old recipe. The dish is now a "can't remove" mainstay of the Bottega menu. These gnocchi have just four ingredients: ricotta, flour, egg yolks, and salt. Use a very good ricotta, such as Bellwether Farms' sheep's milk ricotta. This gnocchi needs a 48-hour lead time because you'll let the ricotta drain overnight the day before you make the gnocchi and then you'll freeze the gnocchi for 24 hours before cooking. Drain the ricotta by lining a colander with cheesecloth and setting it in the sink. My mom used to make a little sling out of the cheesecloth and hang it right from the kitchen faucet. You want your work surface to be cool. Marble is ideal - a marble pastry slab or countertop is best. If you don't have marble, try laying a few ice packs on the countertop while you make the dough. When you're ready to roll, put the ice back in the freezer and wipe down the work surface so it's dry. The sauce recipe makes about 4 cups, which is more than you'll need. You can't cut the recipe in half, because the chicken needs a good amount of sauce to simmer in, but having my nonna's sauce in your freezer is never a bad thing. Using the back of a large spoon, press the ricotta through a fine-mesh sieve into a large bowl. Add the egg yolks and sea salt and mix with a rubber spatula. Gently fold in the 3/4 cup flour; the less you work the dough, the lighter and more tender the gnocchi will be. Cover and refrigerate for 30 minutes. Lightly sprinkle your work surface and two baking sheets with flour. Pull off about a quarter of the gnocchi dough and gently roll it into a rope about 1 inch wide. Using a dough scraper or a sharp knife dipped in flour, cut individual dumplings from the rope into 1-inch pieces. Gently transfer each piece to a prepared baking sheet and dust with flour so it's lightly coated. Repeat with the remaining gnocchi. Heat a pot of salted water (see note, at right), and, while the water heats, put the sauce on the stove over a simmering flame so it's warm when gnocchi are cooked. When the water comes to a boil, cook two dozen frozen gnocchi for 3 to 3 1/2 minutes, or for 30 to 45 seconds after they rise to the surface. Using a slotted spoon or a wire skimmer, transfer the gnocchi to a warmed plate. Add another two dozen gnocchi to the pot and, while they cook, finish plating the batch of gnocchi you just took out of the pot. Spoon about a dozen gnocchi per serving onto a warmed plate. Drizzle with olive oil. Spoon a little of the warm tomato sauce on top and finish with a sprinkling of pecorino. Note: Salting Pasta Water -The Italians have a saying: "The pasta water is salted enough when it tastes like the sea." If you can't taste the salt in the water, you haven't used enough. The basic rule is 1 tablespoon of kosher or sea salt for every 1 quart of water. Always reserve a bit of pasta water. If your pasta seems dry, spoon on a little pasta water and toss just before serving. For more recipes go to page 2. For the vinaigrette: Use a juice extractor to juice the lemons, orange, and shallot, using the entire fruit. Pour the juices into a small bowl and gradually whisk in the olive oil in a thin stream to form an emulsion. Season with the salt and pepper. Taste and adjust the seasoning. Whisk again, cover, and refrigerate for at least 30 minutes or up to 3 days. You should have about 2 cups. To sieve the eggs: At Bottega, we push the hard-cooked egg whites through the sieve separately, then sieve the yolks and layer the two separately when serving. If it's easier, you can sieve the whole eggs and not bother separating whites from yolks. Using a mandoline, carefully shave each Brussels sprout holding the stem end. You should have about 9 cups when they're all grated. In a large bowl, toss together the shaved Brussels sprouts, sieved eggs, and chopped almonds. Pour on about 3/4 cup of the vinaigrette and toss again. Spoon into chilled small bowls and top with the pecorino. Top with a little more of the vinaigrette. Summer Variation: Substitute 9 cups of julienned sugar snap peas for the shaved Brussels sprouts. Cook's Note: If you don't have a sieve for the egg, don't go out and buy one: improvise. My mom was a master at using one tool for another job; for this, you can use a box grater, a slotted spoon, a colander, or anything with holes that you can push an egg through. I remember the day my grandmother Vicencina proved to me that an ornery chicken made the best-tasting brodo. While my grandmother gathered eggs, one bird made the fatal mistake of pecking her ankle, poking a hole in her thick brown support hose. I was small, but even I knew that the bird's hours were numbered. I don't know if the sauce my grandmother made that day was so good because revenge added its own seasoning or just because it wasn't the hens' time, but the flavor of that rich chicken has stayed in my memory all these years. My mom made this sauce often for gnocchi, and whenever she did, she would pull the hen out of the sauce at the last minute, keep it warm, and then serve it as the secondi, or second course, with fresh-chopped parsley and a little basil. I suggest you try this, too. Preheat the oven to 300 degrees F. Heat a large Dutch oven over medium-high heat and add the oil. Season the chicken with salt and pepper. Add the chicken to the pot and lightly brown on all sides, about 4 minutes per side. Using tongs, transfer the chicken to a plate. Place the Dutch oven over medium-high heat and saute the carrot, celery, onion, and garlic until tender, about 8 minutes. Add the rosemary, bay leaf, and red wine. Stir to scrape up the browned bits, then return the chicken to the pot. Cook to reduce the wine until the pot is almost dry. Pour in the milled tomatoes and season the sauce with salt and pepper. Using tongs, transfer the chicken pieces to a plate. You can keep the chicken warm and serve it as a second course, or let cool, wrap, and refrigerate for another use. Add the torn basil leaves to the sauce and use this in place of any marinara sauce. CHEF'S NOTE: Tomatoes put through a food mill have the right consistency for the sauces I make. If you don't have a food mill, you could pulse tomatoes just 3 or 4 times in a food processor (don't overprocess them), but to get the same velvety consistency of the sauces we serve at Bottega, a food mill works much better, and is an inexpensive addition to your kitchen tool set. larger than the pot. Holding one point of the parchment sheet toward you, fold the parchment into a fan, starting at the left side and folding back and forth to create accordion pleats. Hold the parchment fan over the pot with the tip of it dead center, then use kitchen shears to snip off the fat end in a curve. The sweating lid will fit down inside the pot and sit right on top the bird as it cooks, keeping it moist and flavorful. Remove any rind from the cheeses and chop the cheeses into rough 1-inch chunks. Pulse the cheeses in a food processor until reduced to the size of a fine pea gravel. Transfer the cheese to a bowl and stir in the green onion and garlic. Add the oregano, rubbing between your fingers to release it's fragrance. Add the black pepper, red pepper flakes, and olive oil. Stir well. Cover and let stand at room temperature at least 4 hours before serving.